Emerald Cunard favoured the Dorchester where, indeed, she spent most of the war years. Ex King Constantine of Greece has made a favourite of Claridges. Each one of us has, of course, a preference where London hotels are concerned. For us it is the Savoy. And so, a little over a week ago in the middle of May, we returned for the first time since the major refurbishment which, over the past couple of years, has necessitated the closure of the doors of this most iconic of hotels. At a cost reputed to be over £100 million, this has been one of the most ambitious of hotel restorations in British history. Today the Savoy is a synthesis of past and present, of tradition and modernity, where Edwardian elegance at its grandest, combined with shades of Art Deco, meets most happily with cutting edge, twenty-first century design. We lunched at the best possible of tables in The River Restaurant directly overlooking the Thames. Booked by our Russian friends, who stipulate the finest of everything, we secretly wondered if, as with so many oligarchs from that most mysterious of countries, they were sounding out the hotel in readiness for a takeover. Nothing would surprise us with those two! Only time will tell! Luncheon was delicious. 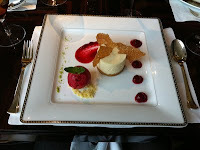 Beautifully presented food, efficiently and professionally served, and accompanied with very fine wines. And afterwards coffee, by which time as we left, the afternoon well advanced, within The Thames Foyer through which we passed, afternoon tea was well under way. But then, as we all know, the Ritz is the place for that! Thats look really great and the lunch also. You are lucky to have friends like this. It was the most wonderful afternoon. And yes, we think ourselves to be very lucky with our friends. What a fine way to spend an afternoon. When I lived in the UK, the London hotels were always a lure for lunch and afternoon tea, a bout of concentrated sophistication being a perfect counterpoint to country life. Leisurely lunches and people watching are two of our absolutely favourite activities, both of which can be so comfortably carried out in a wonderful hotel. I'm so glad that it didn't disappoint, I've been dying to hear your thoughts. 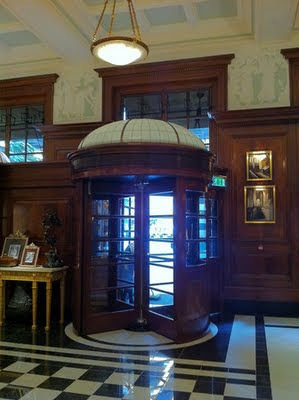 I've always been a Claridges girl but now I'd have to say that The Savoy and Claridges are my favourite London hotels. The Ritz is too fussy for me, for afternoon tea - Fortnums - oh to sweep down that staircase in a bias cut silk gown. We are so pleased that the Savoy is a favourite with you too. And yes, it really was excellent in all respects - including the most wonderfully appointed lavatories. Sadly, we cannot remember the last time we were in Claridges, but are sure that if it gets your vote it would also get ours. We can well imagine you in the bias cut silk gown. Do wear it when you visit us in Budapest!! Lovely and kind friends! those interiors look great- and the foods too. its appetite for every senses. Hello Jane and Lance - this is a most interesting post for me as I am a big fan of art deco furniture and style. 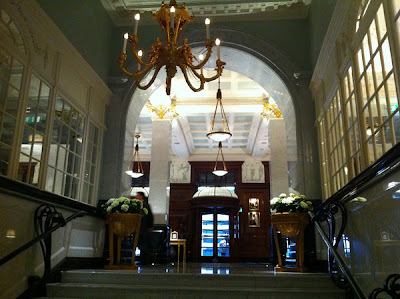 The newly re opened Savoy is on my list to visit when next in London. Unless I can find some oligarch's to help out, I'd better start saving now! But the food looks exquisite and we do eat with our eyes after all. When we were last at the Savoy [before the restoration] we came away hungry such were the beautiful, yet meagre portions. This time, the food was plentiful, delicious and elegantly presented. As you say, a feast for all the senses! We are sure that you would love it. Our photographs do not really do it justice. Our only quibble was the rather odd metal structure that they call the 'Winter Garden', although the pianist inside it played beautifully! Dear Jane and Lance, Ah, the Savoy...it's like Chanel No. 5. It will never go out-of-date. Your Russian friends sound wonderful. They are like you - ladies and gentlemen who luncheon or do things in style. I recently read that London's St Pancras Renaissance Hotel re-opened recently. Stephen Bayley wrote a glorious review about it in the Telegraph. He said "Grand is back in fashion for hotels"...I think he's got it right! One does live in the world of wild imagination these days...I was dreaming the other day; how lovely it would be to stay at the St Pancras Hotel and go to see the Chelsea Flower Show and meet the horticultural crowd. It would definitely make a change from the art scene. Yes, the Savoy has great style. You would, we are sure, love it! How strange that you should mention the St. Pancas Hotel since that was a topic of conversation over our luncheon and is to be our next meeting place with our young Russian comrades [who love all things grand]. Alas, G, Chelsea is not what it once was and attracts a very different crowd [and we mean crowd] these days. Years ago we went regularly on Sundays before it opened to the public. Those were the days! The Savoy is indeed the stuff of which dreams are made! There are certain blogs I read which are all pleasure. I won't even say guilty pleasure because there is no guilt involved, just a deep appreciation for the variety of experience and place out there. I have never left North America and am so deeply gratified by the vicarious opportunity granted by well-written accounts with luscious imagery such as this one. What a very generous comment, for which many thanks. We have never visited America and do hope to do so one day. In the meantime, like you, we travel virtually! I really, really love this glimpse of your life. I love reports from good restaurants, which, hypothetically, I might visit in the future. At this moment, I'm just happy for you. We do appreciate your very generous comment. Thank you. We must confess that we do enjoy dining in hotels. 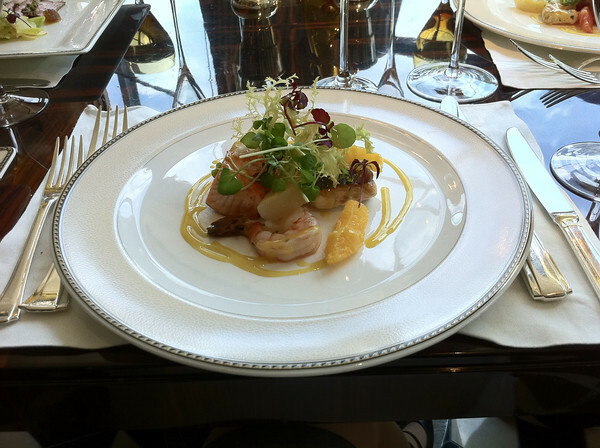 Browns, in Albemarle Street, for Sunday luncheon was a favourite for years. I really enjoy reading your blog. Here on my isolated NZ hillside I can visit you in London and Hungary, Craig in Scotland, Thomas in Bath, and of course John in Wales. God bless the internet! A sentiment we entirely endorse. And we too, of course, are able to think of you on your hillside in New Zealand, thousands of miles away but, at the same time, right here with us in Budapest. And it is all such fun - harmless at that! Your lunch looks so much more lovely than mine! The setting is gorgeous and I'm sure the company, divine. I've never stayed there (I'm a Browns of Dover St chap) but my old school chum Michael Morpurgo was 'writer in residence' there for a while, and had a permanent room. He rather liked it too! We do have to say that it was all rather delicious. But then, as you may imagine, we had such fun with the Russians who are totally mad in the nicest possible way. 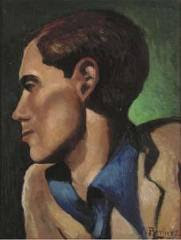 We thought it a trifle vulgar to mention tea at the Ritz, drinks in The Lobby Bar at One Aldwych, and dinner at The Ivy. But then that's the Russians for you!! How splendid that you were school chums with Michael Morpurgo! As we remarked to Olga, above, Browns was a favourite of ours for years, particularly for Sunday lunch. Perhaps we might have collided there once! There is absolutely nothing of the country bumpkin about the Cotswolds. Far from it, as it is definitely one of the smartest places in England and, of course, one of the prettiest. Your local restaurant sounds wonderful, and the cakes and tarts in the hands of an Austrian could not, we feel, be better. Well clearly ZP thinks so!! Be afraid. There are now flights from Edinburgh to Budapest. I am not beyond clambering onto a plane in silk - will you have a proper head included fox that I may wrap around my shoulders? Fox not needed as temperatures currently 30C and rising. Tímea is, as we write, on stand-by and we are en route to the airport to take up a daily, and nightly if necessary, vigil in anticipation of your arrival! This is such a wonderful post and brings back happy memories of times spent visiting my Sister in London. I must agree The Savoy is a very special place and after looking at your splendid pictures, I am looking forward to seeing it again in all its splendid glory. We always enjoy afternoon tea at Laduree next to Harrods, although the location is not quiet the same as in Paris, the macaroons are heavenly. Dinner at the Ivy? You show-offs. (Cro - I'm impressed that M. M. was an old chum of yours. He's a bit of a late hero of mine). Now, dear Hattatts - I hate to ask this, but I really need a favour. My chums Julian and Isabel Bannerman are selling their wonderful gaff, Hanham Court, between Bath and Bristol. I used to know the previous owners, but I couldn't (at the time) afford the £120,000 to buy it 17 years ago. I too am so grateful to you for bringing us along on your most wonderful lunch! I've not been to the Dorset, now I know how much I am missing. Love the last line...of course,the Ritz! Looking forward to that post. Well, at least you have been to London whereas Seattle is a complete unknown to us. Before the restoration, the Savoy was rather like a dimly lit Gentleman's Club, all dark panelling, leather armchairs and cigar smoke. Now, if we could change anything, it would be the lighting level which is rather too bright compared with the much more forgiving gloom of yesteryear! How wonderful it will be to meet up with your sister and catch up on all your news whilst dining at the Savoy. And, macaroons in Laduree.....we had no idea that this iconic Parisian store had arrived in Knightsbridge! We only know of Hanham Court by repute, but understand it to have the most wonderfully exciting gardens. But surely, Tom, you have no wish to leave the Royal Crescent for the country? However, if you insist, the cheque is as good as in the post! It was, we have to say, the most glorious luncheon. And, as always, our Russian friends were on sparkling form. The Savoy! I used to take my clients there for lunch. I haven't seen it since it's refurbishment, but have seen the photographs and it looks absolutely amazing. What is it with Russians wanting to buy British landmarks? My Russian chum wanted to buy Gatwick of all places. The Russians attended the auction sale prior to the refurbishment and, as a result, we have Savoy plates and pudding spoons, all marked with the name. When we use them it rather gives the impression that we have stolen the silver! We have no television otherwise we should have definitely watched the programme you mention. Do go to the Savoy when you are next up in London. You will love it! I liked the Savoy even in its last decadent years. I'm glad to hear that they have reopened. Lucky you that have already been there. Yes, the Savoy, in our view has re-opened in style. You must visit when next in London. Lovely photographs. I can't imagine producing my camera in such grand surroundings - and if I did furtively snap a pic or two the images would be out of focus for sure. The newly refurbished Savoy Hotel looks really charming! Please take some more photos of the halls the next time you go there! What a lovely way to spend the afternoon with friends ! I have never afforded more than afternoon tea in an historic London hotel, but I lecture often on the history of travel and tourism in the late Victorian-Edwardian era. It must have been extremely lush, for those who could afford the top end of the market. Your photos show the Savoy's new spaces looking very glamorous. I would love to visit next June-July. But in a time of severe budget cuts in every aspect of national life, was it worth the £100+ million price tag? And was the timing right? Oh, this sounds absolutely splendid! Hmmm, I love such recommendations and will be back with some of my own from Berlin! We have friends getting married on Peacock Island on Wannsee, one of the most picturesque places of 19th century Berlin. Beautiful gardens and a small castle! Take care! Will be back soon! There really is no place like London and well, a newly-revamped Savoy and lunch shared with the oligarchs sounds positively regal. So glad you and Lance had such a chance. Hello Jane and Lance - this entry was wonderful...almost like being there although, not quite -smile-. I didn't realize about the road outside being on the right and only one in London...interesting. Alas, I traveled nonstop on business for several years and the past three or fours years I have banned all travel and hotels from my life! But your post on the Savoy is making me reconsider that ban! It may be time to start moving and get out there again! One does indeed feel like the worst kind of tourist taking pictures wherever one goes. But, as you will know for yourself, this is what the whole world does when not talking on a mobile telephone! We are delighted to welcome you, and thank you for such a kind comment. We shall very much hope to see you again. In the meantime, good luck with the learning of the sign language! The Savoy, as you can see, is now really rather splendid and the level of service excellent. When you are next in London, do be sure to go. We always have a wonderful time with our Russian friends who are exceedingly good company and know how to do things in style. How very interesting to know that you lecture on tourism and travel at the start of the C20. However, we are not surprised as your posts are always exceedingly erudite and informative [and we have learnt so much]. It does seem to us extraordinary that such a sum of money should be spent on a single project during a recession, and with a loss of business for over two years. But do try to fit it in when you come to London. It is worth seeing. Berlin is high on our list of places to visit and is now, we believe, a most interesting city with many excellent museums and art galleries. The wedding will, we are sure, be great fun and we do hope that you will return with much to post about. Meanwhile, if you have the chance, do try out the Savoy. We did, indeed, have a really splendid time. But London these days is so very crowded and, unlike Budapest, always seems filled with tourists. But they are, of course, good for the economy!! Yes, it is so very odd that that one street, and there are no others anywhere in Britain, should have traffic driving on the right hand side of the road. For what reason, we have no idea. Very confusing! Oh, we do understand what you say so very well. Travelling is most tiring and, as with you, if you have had a lot of it in your working life, then it is really rather nice just to be at home. Thank you again for visiting and commenting. Like you, we too were concerned as to how the Savoy might be following the major refurbishment and rather dreaded that it might, in the process, lose so much of its character. Our fears were totally unfounded and it is, we assure you, as before but equipped for the C21. Thank you for a very informative view of the Savoy. How kind of your friends to take you here. Your writing is so enchanting, it transported me to London and I felt like I was along for lunch too. The Ritz is also a favourite and afterwards a spot of shopping at Burlington Arcade and then onward to Hatchards for some reading material and back to Fortnum & Mason for some snacks for later. We used stay at the "In & Out Club" at Picadilly and Halfmoon, which sadly has re-located. Well now that I have had my lunch at the Savoy I had better amble to my studio. What a wonderful comment. And now we too are transported from the Ritz along Piccadilly to the Burlington Arcade, to Fortnum and Mason and, of course, Hatchard's, probably best of them all [certainly the most interesting!]. Did we read that you had been brought up close to Coole Park? For us, forever immortalised, not just as the house of Lady Gregory but for Yeats' poetry - 'Wild Swans at Coole' being a particular favourite. But then, we are madly enthusiastic for all things Irish, and Irish writers in particular. For years we dreamed of living in the manner of characters [always flawed] from a Molly Keane novel, somewhere on the West Coast! Funny that is the only place where driving is on the right. Turns out my street is too, in my absentmindedness! This hotel looks gorgeous - any front row seat on the Thames, and I'm in. We do know what you mean about the right and wrong side of the road. Something we never quite get used to here in Budapest! Yes, do try the Savoy - we are sure that you will enjoy it. What a beautiful interuption, I am reciting "the wild swans at coole" and, like addictive foods, I cannot stop at one, so have been reading more of Yeats works. Yes, I did grow up close to Coole Park and often in Ireland I visit "Thoor Ballylea" where WB Yeats has his modest castle. It is a magical beautiful spot where one can be alone enveloped in his poetry. How did you like "In Memory of W. B. Yeats"
On that note, "I shall arise and go now and go to Innisfree"
i was no nervous I dont remember the food at all! Oh, and Auden too. We had forgotten Auden. Yes, yes, and yes again. Oh, give us GRAND any day! We are delighted that you are of the same mind and, yes, the Savoy was a wonderful treat and one which we have every intention of repeating. One should never be nervous or intimidated in such places. Always remember, one is a paying customer and, nearly always, the staff are so nice and so anxious to please. Thank you for the Savoy update,we went with friends some years ago and it was dire,poor food and not very clean!! So safe to venture in again. This sounds to have been a nightmarish experience. How awful. Well, all we can say is that we would think that it is safe to return now, although it is always a trickiness recommending a restaurant to someone else. We are so sorry that your comment did not reach us. We, along with many others lost comments on the Blogger Titanic! If ever you find yourself in London, we know that this is somewhere you would very much enjoy. What a wonderful place to spend some time with your friends! How kind of your friends to take you here. This hotel looks gorgeous. Yes, we enjoyed such a happy time and the food was delicious. If ever you find yourself in London, it is worth a peek! We really do appreciate your very kind and generous comment and are delighted to meet you too! The Savoy is, since its refurbishment, rather splendid and if you ever find yourself in London, then you must try it out. One day, when you are in London, you really should treat yourself for we are certain that you would have a most enjoyable time. It is an experience! Yes, splendid is quite the word for it all. And, we really did have the most wonderful time. I have recently started following your blog, having discovered it through Tabitha's Bourbon & Pearls blog. I am really enjoying it - so many wonderful photos! 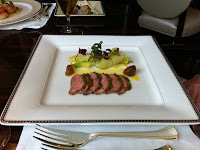 Thank you very much for posting about your visit to the Savoy. The food and the surroundings look beautiful! 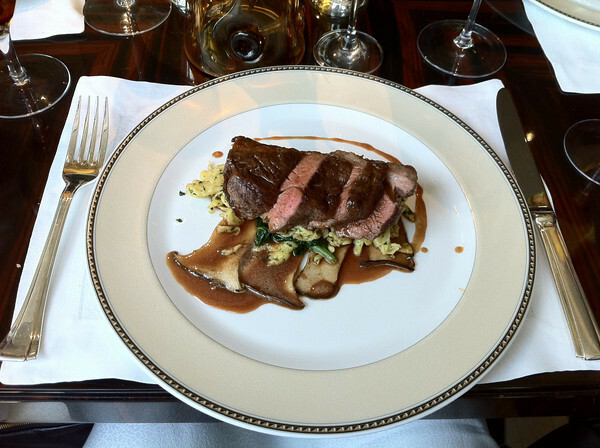 I will definitely have to visit the Savoy the next time I am in London. What a gourmet meal!! I will have to go there. Sumptuous is the word that springs to mind. The food looks wonderful and I do like to see some space on a plate. I haven't been into any of the old, Iconic London hotels for years. Nice to see them being brightened up, for a while they all looked and felt a bit dingy. I can't help thinking it was a rather smart thing to do: shut the place for necessary renovations while everyone was knee-jerkily tightening their belts, and reopen just as boredom with frugality had reached tipping point. We are delighted that you are enjoying the blog and thank you for your kind and most generous comment. We are, we hope, now following you too but it seems that, at the moment, there is a problem with Blogger where Followers keep disappearing. However, we shall keep watching the situation and will certainly look forward to staying in touch. It was all great fun and you should, definitely, give it a try. 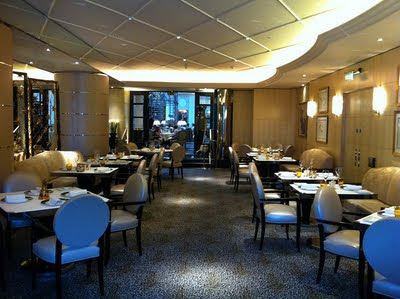 We knew the Savoy well before the refurbishment and have to say that it is entirely different now, and very stylish. What a splendid term, 'boredom with frugality', which probably sums up how so many people are feeling at the moment. Your point about the timing of the closure is a very good one. The food was exceptionally good. Enough without being overdone, nor leaving one with the feeling that one could have eaten more. We took some Australian friends to the Ritz for Afternoon Tea a few years ago and they loved the traditional feel of the place. We are so fortunate to have these iconic hotels in our capital. Must take a visit to the Savoy. I watched the TV documentary about the refurb recently. A lot of money was spent but you can definitely see where it has gone! Btw, thank you Jane and Lance for your always lovely comments over at mine. Ah, The Ritz! Always considered the number one place in London for tea, and probably hard to beat. We did not see the programme about the refurbishment at the Savoy but it is, in our view, well worth a visit when you are next in London. And, thank you, but to visit your blog is always a great pleasure. We really did have a most enjoyable time and lunch stretched out well into the afternoon. You may not have been to the Savoy, but we are sure that you have had all manner of wonderful experiences yourself - with plenty more to come! I returned to your blog so I could read some of your previous posts. The picture on your post, A Horse in the Drawing Room, of Lord Berners painting John Betjeman's wife and her horse, appeared in todays edition of The Telegraph. On seeing this, my husband commented that the only way he would entertain my pony in our home would be if he was stuffed. Of course I do not like to think of such things, but on reading your post, And No Bird Sings, I remembered Napoleon's horse Le Vizir was indeed stuffed and mounted, so thoughts of Spotty in a glass case did spring to mind. Of all your posts, When the Last All Clear is Sounded, is one I can relate to. I hope you celebrate every day by enjoying all that life has to offer, including many more visits to the Savoy. What a lot of money but I think that the results speak for themselves - magnificent! I would love to see it one day myself. Lunch looks delicious and it sounds like you had a wonderful time. Did you go to the Ritz also or is that for another day?! A happy and peaceful weekend to you and thanks as always for your lovely comments - I love reading them - they are always so thoughtful and beautifully written. I was avoiding making a comment because you seem to be inundated with them! Nonetheless, a splendid post. There is nothing quite like eating out - my father used to take my family to restaurants in Melbourne in the 1960s and 70s when no-one else much did - certainly none of my friends' families did. It might be a while before I get to the Savoy though! But the church and the arrangements looked so lovely. How could one not say? We do hope that you will enjoy your time today having your hair done. As it happens, last night we were invited by András, our hairdresser, to have supper with him! We had huge fun. We very much like the sound of the Chelsea Arts Club, somewhere to which we have not been. It sounds great fun and our kind of place. Another hot day is starting here in Budapest. We hope that it is the same with you. How really kind of you to have taken the time and trouble to read through our previous posts. It is much appreciated and we are pleased that you found something of interest. It is somewhat strange that the picture of the horse, LB, et al should have recently reappeared in The Telegraph. It is, we think, great fun but, possibly, your husband is simply being practical when denying Spotty entry into the house! Le Vizir may indeed have been stuffed, but Spotty is very much alive and well. Long may that be the case [and no pun is intended]. We trust that you too will have a very enjoyable weekend. And thank you again. We did indeed have such a jolly time at the Savoy with our Russian friends who are always great company. No, we did not go on to the Ritz [too much of a good thing] but instead went back to their London apartment for tea. It is a pleasure to comment on your blog - we always enjoy reading it. I love grand old London hotels! Sure, I love little, modern boutique hotels as well. But those palace-style places like the Savoy -- with their high ceilings, moulding, wood panelling and marble floors -- are so very atmospheric. Faisal, we always enjoy having comments and so we are, of course, delighted to have yours. We can only imagine that it must have been very smart indeed to have been eating out in Melbourne during the 1960s and 1970s. Your father was obviously a man of flair, style and vision! You are absolutely right about that rather certain atmosphere of some of the old London hotels. Is it to be found, we wonder, in similar hotels of that period throughout the world? Strangely, although very large, the new look Savoy manages in part to create the more intimate feel of some boutique hotels. hello. My father was what I would call a gourmand: with a bottle of red and friends around him, he was in his element. He was careful in his dress, so much so that even my school uniform was tailored. I still have a pair of his cuff-links and a couple of his handkerchiefs. Melbourne was actually once known as 'Marvellous Melbourne', the richest city in the world, due to the discovery of vast amounts of gold nearby. It was very staid in the 1960s and 70s, but the food here now is exceptional. We must confess to rather liking people such as your father who [although they may not be the easiest to live with] do have a generosity of spirit [or wine in his case] which is often rather lacking these days. And how wonderful that you are able to draw on memories of 'Marvellous Melbourne' although, as you suggest, the food is probably a great deal more imaginative these days. We actually prefer to go out for long leisurely lunches than dinner, drinking wine and then long walks...makes me wish we were there. We too rather like extended lunches and for the reasons you give. And afterwards there is always the possibility of doing something else, like walking it off, and the evening still lies ahead. At the risk of boring you, my father was extremely difficult...I had no way of dealing with him but to shut up. Later, when I'd found my words, he was as decent as his identical twin brother, an evangelical minister, is. I'm very grateful, really, for being obliged to keep my peace, for it delivers words of value, later. You are not, nor would you be, at risk of boring us. What so much appeals to us about blogging is the wonderful opportunity of 'meeting' with people such as yourself. We rather thought that your father might have been somewhat 'difficult' - such people often are, more so when one is young. Thank you! It was,as always, a great pleasure. We look forward to your posts. Beautiful Post! I am familiar with Claridge's; its gilded Art Deco Bar has actually been source of inspiration for a residential project. These pictures of the Savoy were a treat, and an interesting coincidence because I just read an article about Art Nouveau! Just the name "Savoy" evokes a bygone era, it's so nice to know now that they tried, and it seems succeeded, in preserving that special 'era', such relief. What a lovely day you had...I'm sure the rest of your English visit was also just as lovely...and also blogworthy. Claridges too, we understand, has fairly recently been refurbished in part, but nothing on the scale of the Savoy. How strange that you have been reading about Art Nouveau at this time. Elton Palace, on the very edge of London, is a very fine example and well worth a visit. We do so appreciate your kind comment. Jessica, you are so right in saying that the very name 'Savoy' conjures up an era long passed. But it is still possible to inhabit that time, albeit over a lunch, for a short while and leave, afterwards, feeling refreshed by the experience, if not a different person! It is always so reassuring to know that one is not alone. From what we are able to gather, the problems have been fairly widespread. We have to admit that everywhere was exceedingly spotless. And the lavatories [if we must go there!] were amazing - both men's and women's! Thank you for Following my blog, I'm touched everyday by the people who find my little piece of cyberspace and leave such lovely comments. I have been perusing your blog, and it's just lovely! Thank you for the tour of the Savoy. Lunch looked delicious. Some day I hope to go to Europe with my husband, I've been twice, many years ago, he's never been "across the pond." When I read about your husbands health problems my heart sank, I'm so happy he's in full remission. I will add him to my "prayer pot" and remember him nightly. Your Belleek Nautilus is stunning! I can't tell you how many times I've fawned over that pattern. I have a small collection which I adore. I've enjoyed my visit today, and I can't wait to show your blog to my husband. Have a wonderful weekend! And, thank you too for returning the compliment and following. Such kind and generous words, we are delighted that you have found so much of interest. We hope that perhaps you may show some of your Belleek collection one day. We have only a small number of pieces too and are constantly afraid that they may break as they are so fragile. How very kind to remember us in your prayers. Well, I don't know what happened but I think that I was so caught up in revery about this post that I thought that I had responded but had only done so in my head. It happens sometimes. But how lucky am I to come back again and to read so many, many amazing comments and exchanges. Yeats! And I can say (at my level of travelling, which is not as much as I would like it to be) that yes, yes, the grand hotels of egypt, of South East Asia are truly something. Oh there is too much to respond to so I will just say thank you for this lovely post. One last thing (that I will hide from Remi--oh!) is that my Mom, who loves to dine well whether it be in a shack in Louisiana or a palace, said that her very best meal, ever, was a dinner at the Savoy. True, this was before Remi was cooking for her when she visited, so perhaps he wouldn't be so angry. :) It did look like a lovely time though (and I have a hard time imagining either of you taking photos of your plates! Oh the sacrifices we make for our blogs!). Actually another last thing that I feel worth mentioning--I never see anywhere else the response, the dialogue that your blog inspires. Of course, we did not photograph the food on the plates....our Russian friends did that for us. We could not possibly have been caught in the act, too shaming, but with their 'smart phones' the whole process was accomplished without incident. Your mother sounds to us very much a kindred spirit, although Remi's cooking we are sure is Cordon Bleu!! 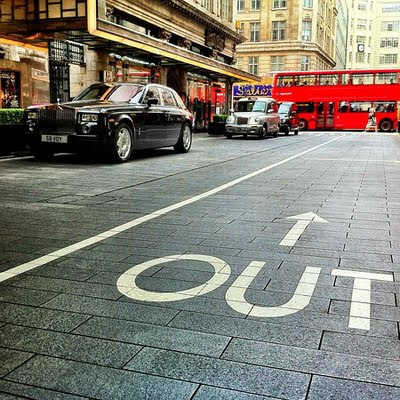 Final thought on this post - I hope the signage in the last photograph was a direction rather than an instruction after your luxurious lunch at the Savoy! Now, we are tempted to say that would be telling! As it happens, we left of our own accord. we're on our way to London in a few days, and I'm so disappointed we didn't arrange for a lunch at the Savoy; you've made it sound so enticing. You are most welcome to join us. And, giggling at the table is compulsory!! Even if you are not booked for a meal, perhaps you will have chance to just peek in. It is, as we hope you shall see,well worth a look. Excellent lunch in most sophisticated surroundings! I've always loved the Savoy too. Yes, absolutely! Revisit next time you are in London, it is worth a peek. I have very fond memories of high tea at the Ritz one wintry afternoon... Truly delightful and most civilised! Animals eat, humans dine (and drink, and converse, and joke, and enjoy each other's company at mela times)! We agree. Tea at the Ritz is something of a National Institution and the most perfect place for people watching. You must as you will love it. Leave plenty of time for people watching in the foyer, it is fascinating. They are certainly both first class! Thank you for visiting.We hope that you are having an enjoyable week! I must say I enjoy reading the comments to your posts: Yeats, Coole, Hatchards, Burlington Arcade and last, but not least, the Chelsea Arts Club. All favourites of mine and lovely to read the comments fly to and fro! The post itself was very informative and interesting (I study London history as a hobby). A young friend of mine once referred to me as a Jude the Obscure. I am sure you love Thomas Hardy? How interesting that you study London history. The Savoy certainly plays a significant role and we love our pudding spoons and pudding plates that we were bought from the sale before the refurbishment. Pieces of history we like to think. As for Thomas Hardy, yes, we do enjoy his work, but possibly get most pleasure from his poetry rather than the novels.